A wheel vavle is located at each wheel end. For dual wheels, the valves are typically connected only to the outer wheel so the pressure between the two tires can be balanced. Part of the wheel valve’s job is to isolate the tire from the system when it’s not in use in order to let the pressure off of the seal and extend its life. 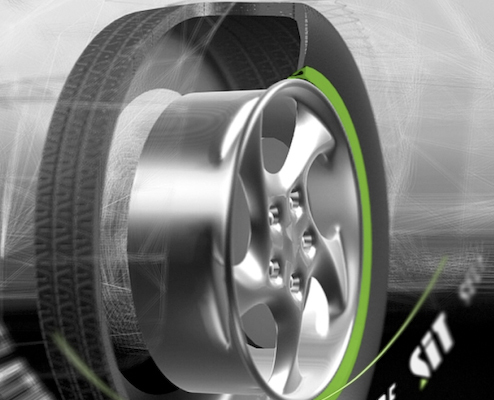 The wheel valve also enables on-demand inflation and deflation of the tires. An electtronic control unit (ECU) mounted behind the passenger seat is the brain of the system. It processes driver commands, monitors all signals throughout the system and tells the system to check tire pressure every 10 minutes to make sure the selected pressure is being maintained. The ECU sends commands to the pneumatic control unit, which directly controls the wheel valves and air system. The pneumatic control unit also contains a sensor that transmits tire-pressure readings to the ECU. An operator control panel allows the driver to select tire-pressure modes to match current conditions. This dash-mounted panel displays current tire pressures, selected modes and system status. When the driver selects a tire-pressure setting, signals from the control panel travel to the electronic control unit to the pneumatic control unit to the wheel valves. When vehicles are moving faster (like on a highway), tire pressure should be higher to prevent tire damage. The CTIS includes a speed sensor that sends vehicle speed information to the electronic control unit. If the vehicle continues moving at a higher speed for a set period of time, the system automatically inflates the tires to an appropriate pressure for that speed. Here is what happens on the road: The electronic control unit tells the pneumatic control unit to check current pressure and either inflate or deflate the tire to the pressure selected by the driver. If the system determines that inflation is needed, it first checks to make sure that brake pressure reserves are where they should be; if they are, it applies a slight pressure to the wheel valve to allow inflation. If the tires are overinflated, the system applies a slight vacuum to the wheel valve. When the pneumatic control unit reads that the appropriate pressure is reached, the valve closes.